Download high-resolution versions of this and other TESS “first light” images from the Scientific Visualization Studio at NASA’s Goddard Space Flight Center. TESS acquired the image using all four cameras during a 30-minute period on Tuesday, Aug. 7. The black lines in the image are gaps between the camera detectors. 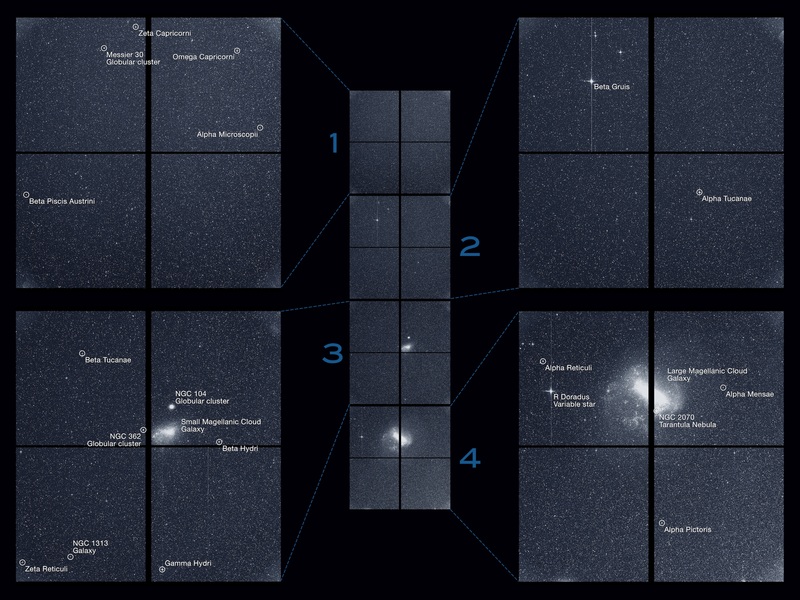 The images include parts of a dozen constellations, from Capricornus to Pictor, and both the Large and Small Magellanic Clouds, the galaxies nearest to our own. The small bright dot above the Small Magellanic Cloud is a globular cluster — a spherical collection of hundreds of thousands of stars — called NGC 104, also known as 47 Tucanae because of its location in the southern constellation Tucana, the Toucan. 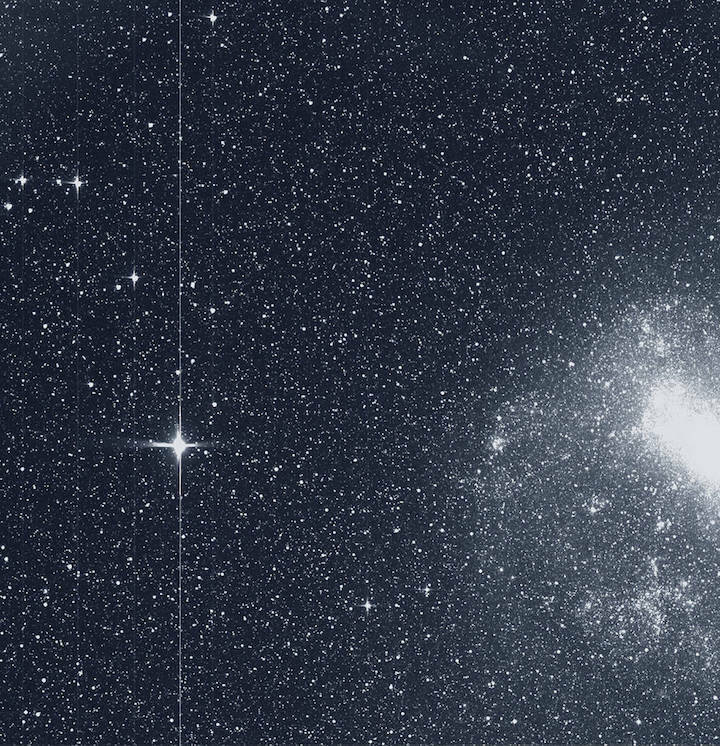 Two stars, Beta Gruis and R Doradus, are so bright they saturate an entire column of pixels on the detectors of TESS’s second and fourth cameras, creating long spikes of light. The Transiting Exoplanet Survey Satellite (TESS) captured this strip of stars and galaxies in the southern sky during one 30-minute period on Tuesday, Aug. 7. 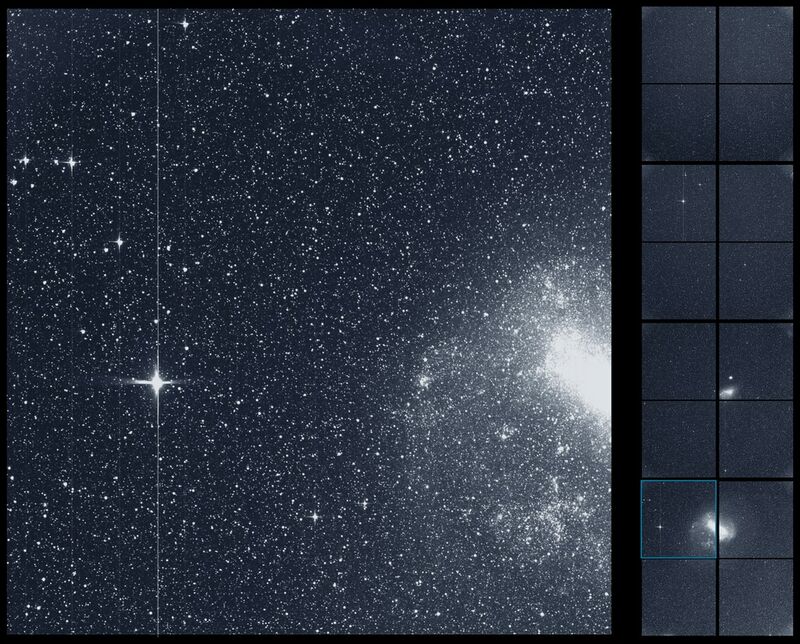 Created by combining the view from all four of its cameras, this is TESS’ “first light,” from the first observing sector that will be used for identifying planets around other stars. Notable features in this swath of the southern sky include the Large and Small Magellanic Clouds and a globular cluster called NGC 104, also known as 47 Tucanae. The brightest stars in the image, Beta Gruis and R Doradus, saturated an entire column of camera detector pixels on the satellite’s second and fourth cameras. Drag the slider back and forth to see the labeled and unlabeled versions of the image. MIT coordinates with Northrop Grumman in Falls Church, Virginia, to schedule science observations. TESS transmits images every 13.7 days, each time it swings closest to Earth. NASA’s Deep Space Network receives and forwards the data to the TESS Payload Operations Center at MIT for initial evaluation and analysis. Full data processing and analysis takes place within the Science Processing and Operations Center pipeline at NASA’s Ames Research Center in Silicon Valley, California, which provides calibrated images and refined light curves that scientists can analyze to find promising exoplanet transit candidates. TESS builds on the legacy of NASA’s Kepler spacecraft, which also uses transits to find exoplanets. TESS’s target stars are 30 to 300 light-years away and about 30 to 100 times brighter than Kepler’s targets, which are 300 to 3,000 light-years away. The brightness of TESS’ targets make them ideal candidates for follow-up study with spectroscopy, the study of how matter and light interact. This animation shows how the Transiting Exoplanet Survey Satellite (TESS) will study 85 percent of the sky in 26 sectors. The spacecraft will observe the 13 sectors that make up the southern sky in the first year and the 13 sectors of the northern sky in the second year. TESS launched from NASA’s Kennedy Space Center in Cape Canaveral, Florida, on April 18 aboard a SpaceX Falcon 9 rocket and used a flyby of the Moonon May 17 to head toward its science orbit. TESS started collecting scientific data on July 25 after a period of extensive checks of its instruments.